Haq's Musings: How Would Trump's Plan to Bar Muslims Impact Pakistanis & Pakistani-Americans? How Would Trump's Plan to Bar Muslims Impact Pakistanis & Pakistani-Americans? The notion of banning all members of one religion from the country "is not what this party stands for," said Republican House Speaker Paul Ryan at Capitol Hill. Ryan's rebuke made even more powerful by the fact that he typically avoids commenting on the presidential race. "More importantly, it's not what this country stands for." US allies in Europe, including British Prime Minister David Cameron and French Prime Minister Manuel Valls have also condemned Trump's call. While the chances of Trump's plan becoming reality are remote at best, there's clearly widespread concern about immigrants from Muslim nation that could lead to certain restrictions selectively applied to future Muslim immigrants entering the United States. In addition to impacting Syrian refugees' entry, such restrictions will also affect future immigrants from Pakistan. These restrictions will make the process more difficult and could significantly reduce the flow of Muslims and Pakistanis into the United States. Why Pakistan? For two reasons: a) Tafsheen Malik, one of the two suspects in San Bernardino massacre, came from Pakistan on a fiancee visa last year and b) Pakistan is among the top Muslim nations sending immigrants to the United States. 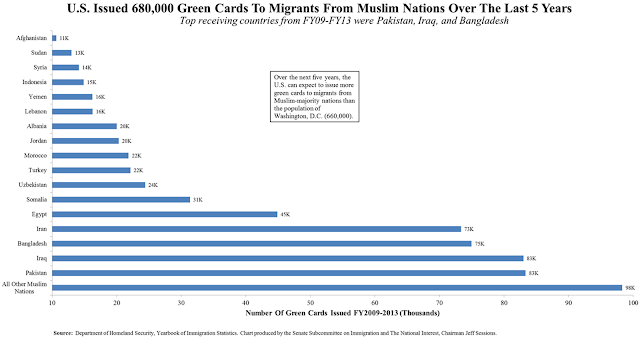 The U.S. granted 83,000 green cards to immigrants from Pakistan and another 83,000 to migrants from Iraq between fiscal years 2009 and 2013, according to a chart produced by the Senate Subcommittee on Immigration and the National Interest using Department of Homeland Security data. 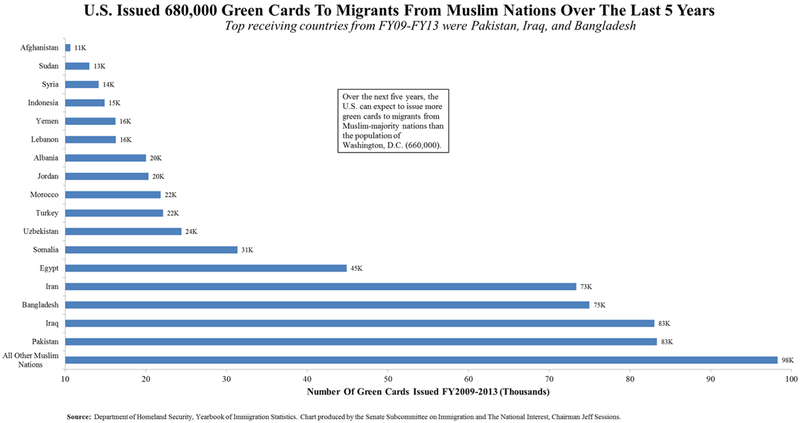 Immigrants from Bangladesh received 75,000 green cards, those from Iran received 73,000, and those from Egypt received 45,000 to round out the top five. In sum, the U.S. granted 680,000 green cards to immigrants from Muslim-majority nations between 2009 and 2013, according to a media report. Pakistani-Americans (pop: 409,163 in 2010 US Census) are the seventh largest community among Asian-Americans, behind Chinese (3.8 million), Filipinos (3.4 million), Indians (3.2 million), Vietnamese (1.74 million), Koreans (1.7 million) and Japanese (1.3 million), according to Asian-American Center For Advancing Justice . They are still a minuscule fraction of the overall US population. However, their numbers have more than doubled in the last decade due to increased immigration, according to US Census 2010 data. 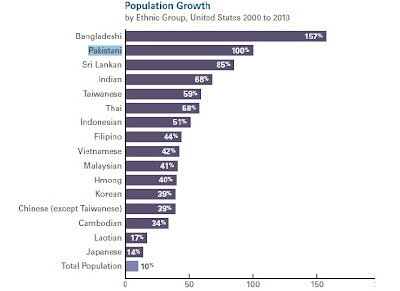 With 100% increase since 2000, Pakistanis are the second fastest growing Asian immigrant group in the United States. With median household income of $63,000, Pakistani-Americans also earn more than an average American household. The most common jobs of Pakistani-Americans include doctors, engineers, accountants, salespersons, administrators/managers and financial analysts, and 55 per cent hold at least a bachelor’s degree which is higher than 49% of all Asian-Americans and almost twice the 28% of overall American population with college degrees. 3. The median household income of Pakistani-American families is nearly $63,000 versus $51,369 average for all Americans. 4. 55% of Pakistanis have a bachelor's degree or higher. 5. 55% of Pakistanis own their own homes. 6. 6% of Pakistani-American population is mixed race. 7. 65% of Pakistanis in America are foreign-born. 57% of foreign-born Pakistani-American population is made up of naturalized citizens. 8. There are 120,000 Pakistani legal permanent residents of which 42% are eligible to naturalize. 9. There were 69,202 immigrant visas issued to Pakistanis from 2001 to 2010, the 5th highest among Asian nations. 10. 28% of Pakistanis have limited English proficiency. 11. 15% of Pakistanis are classified as poor; only 1% of them are on public assistance. 12. 8% of Pakistanis are unemployed, a figure lower than the general population of Americans. Pakistani-American community is still relatively young when compared with other immigrant groups. More of the Pakistanis in America are college educated than the general population of whites and various immigrant groups. They work in high-tech and entertainment fields, start and lead companies in Silicon Valley as entrepreneurs, own major professional sports teams, look after people as health care providers, serve in the US military and hold public offices. The youthful energy and higher education levels of Pakistani-Americans are opening doors for them to rise and shine in America, in spite of the current environment of religious discrimination and other difficulties in their adopted land of opportunities. What america needs is a model minority like Hindus. According to the Pew Research, they are one of the richest and the most educated community in the USA with 74% holding college degrees. They also do not commit acts of terror in the USA - there has been no Hindu equivalent of 9/11, 7/11 or recent californian shooting. They do not ask for sharia law in their host country and they are more than happy to take up the culture of their host countries, unlike muslims who want to impose their culture onto their host countries. No wonder people are approving like of Trump who want to restrain Muslim immigration. Anon: "No wonder people are approving like of Trump who want to restrain Muslim immigration." Fortunately America is not India. Modi, a Fascist Nazi Hindu bigot, can win in India by a landslide. But Trump, a fascist Nazi White Supremacist bigot, can not win US presidency. The only "people approving like of Trump" are known bigots themselves who are a minority in this country. I think you made an gross error. There is no such survey that mentions "Hindu". I am a Hindu but an Indian first and the stats you mention is about Indians. Secondly, the response @riaz about Modi being a bigot is false and championed incorrectly by Congress and it's well connected but unpopular supporters. Modi came in power because of his economic policies and anti poverty ideas. Sugandha: "about Modi being a bigot is false and championed incorrectly by Congress and it's well connected but unpopular supporters"
Modi was a young man when he joined Rashtriya Swayamsevak Sangh (RSS), the extremist Hindu nationalists organization in India, which has a long history of admiration for Adolf Hitler, the Nazi leader, and his "Final Solution". Apparently taking a cue from his Guruji Golwalkar, Modi presided over the 2002 anti-Muslim riots in Gujarat state where he was first elected chief minister in 2001. During the riot, at least 2,000 Muslims were killed by Hindu mobs and several hundred girls and women were stripped naked, raped or gang-raped, had their wombs slashed and were thrown into fires, some while still alive. In spite of the riots (or may be because of the riots), Modi continued to win elections and run Gujarat state as its chief minister since he was first elected 13 years ago. I have several Muslim friends here (including a few Pakistanis). When asked candidly in a private conversation, almost everyone wishes Sharia law to be imposed in the US (if that was possible), as it is God's law. When you cant keep your religion within your house, you give chance for Bigots to raise. sundar: "almost everyone wishes Sharia law to be imposed in the US (if that was possible), as it is God's law." As to the application of Shariah Law in US, there are many religious communities who use their own adjudication methods to settle disputes amongst themselves. Across the United States, religious courts operate on a routine, everyday basis. The Roman Catholic Church alone has nearly 200 diocesan tribunals that handle a variety of cases, including an estimated 15,000 to 20,000 marriage annulments each year. In addition, many Orthodox Jews use rabbinical courts to obtain religious divorces, resolve business conflicts and settle other disputes with fellow Jews. Similarly, many Muslims appeal to Islamic clerics to resolve marital disputes and other disagreements with fellow Muslims. The recent revelations that the San Bernardino shooters had extremist ties to Pakistan might appear to confirm the narrative that Pakistan is consumed by a downward spiral of extremist violence. But over the past year, Pakistan has quietly made some important, costly, and under-appreciated strides in its counter-militancy efforts. Individually, none are groundbreaking, but together they point in a more promising direction for Pakistani society, regional stability, and the U.S.-Pakistan relationship. First, the Pakistani army has pursued more comprehensive military operations in the tribal areas than initially expected. Though it has not directly targeted the Haqqani Network as the United States hoped, Pakistan has actively targeted a wide array of militant groups, not just the Pakistani Taliban (TTP). Hafiz Gul Bahadur, the leader of the TTP and a long-time government tactical ally based in North Waziristan, may have only been displaced to Afghanistan during the early phases of the military’s operation, but the Pakistani army has made his life difficult. It reportedly targeted him, sidelined him operationally from his organization, and then eliminated some of his remaining commanders in airstrikes last fall. Once a potential prospect for reconciliation, Khan Syed Sajna, a former leader of the TTP in South Waziristan, was targeted by a Pakistan Army intent on accepting only unconditional surrenders. Sajna was consequently killed in a U.S. drone strike in late November. The state has also cracked down on potential TTP splinter groups like Jamat ul Ahrar and the Sheheryar Mehsud group, both of which have recently carried out attacks against a provincial government official and a Christian church. Quietly expanded target sets may have resulted from lessons learned, deliberate strategy, mission creep, or failed efforts to flip breakaway factions. But the result is that Pakistan is more directly targeting the Taliban. Second, Pakistani security forces have expanded their counter-militancy operations, not only against assets once under state purview that have now turned rogue, but also against a wider range of sectarian militant groups. Pakistan adopted a strategy of leadership-targeting, or “decapitation” against the once formidable Lashkar-e-Jhangvi, a sectarian militant group with strong links to the Sunni extremist political group, Ahle Sunnat Wal Jamaat. Over the past year, Lashkar-e-Jhangvi leadership – once described as “untouchable” and “invincible” – has been systematically wiped out in a series of extra-judicial killings, possibly because it was drifting towards the Islamic State. In February, the death of Usman Saifullah Kurd – the mastermind behind attacks on hundreds of Hazaras and Shia over the past decade – “[broke] the back” of Lashkar-e-Jhangvi in Balochistan. Several months later, a major police raid killed its leader, Malik Ishaq, his two sons, and 11 other militants. Other Lashkar-e-Jhangvi militants were captured during targeted raids based on specific intelligence in October. And a third leader, Haroon Bhatti, was arrested in late October and then killed in a staged encounter with Lahore police (effectively an extra-judicial killing) two weeks ago. As a retributive response to Malik Ishaq’s killing, Punjab Home Minister Shuja Khanzada, a retired Army Colonel, was assassinated in a suicide bombing along with sixteen others. Despite this, the state proved willing to stomach the consequences of the fight, and showed that it is willing to take on powerful and influential groups – like LeJ – once afforded de facto protection by the Pakistani government. Wrong about MODI. His parents put him for the discipline and character that RSS also promotes. His father could not afford a private education. So Modi has reflected on it several times and he has said there is good and not so good in schools and everywhere but it is upto you. The problem as i see it and as correctly enunciated by Indian PM Modi is that:- "Crime and religion should never be linked". Why differentiate between a terrorist. How does it matter whether he is a muslim or a christian, or a sikh or a Hindu. A murderer is a murderer. While i have a lot of problems with certain policies of Modi, his views on terrorism is very crystal clear, advanced and fair. In fact even when the pseudo seculars were stoking religious passions by citing a murder of a muslim, Modi was clear that a murder is a murder and they have to dealt with law and crimes should not be given religious colour allowing the criminals to get away. People like trump, by not understanding this subtle idea, sterotype an entire religion because one/few individual was a criminal. Similarly, the entire RSS is being portrayed as a bunch of gangsters just because one of its members assasinated Mahatma Gandhi. Our urge to support our ilk and their misdeeds is the main problem. Let a criminal be punished as any other criminal. Isnt it the fair thing to do? Mesq: "the entire RSS is being portrayed as a bunch of gangsters just because one of its members assasinated Mahatma Gandhi." RSS has a long history of murder and violence against minorities based on its hateful philosophy inspired by fascists and Nazis.In his book "We" (1939), Madhav Sadashiv Golwalkar, the leader of the Hindu Nationalist RSS wrote, "To keep up the purity of the Race and its culture, Germany shocked the world by her purging the country of the Semitic races -- the Jews. Race pride at its highest has been manifested here. Germany has also shown how well-nigh impossible it is for races and cultures, having differences going to the root, to be assimilated into one united whole, a good lesson for us in Hindusthan to learn and profit by." The fact is that Modi has been part of what University of Washington researcher Prof Paul Brass calls "The production of Hindu-Muslim Violence in Contemporary India". GP: "First of all Islamophobia is a stupid and nonsensical word. A phobia is an irrational fear of a phenomenon. Fearing the tenets of islam is hardly irrational!﻿"
If US fear of terror was rational, the American Islamophobes would worry far more about gun violence in America that takes 1000X more lives in this country. I am Indian American and wouldn't vote for Trump. Now that this Pakistani couple has done this evil thing many Americans than before are likely to support him. All the hate crimes will rise too and many Indian Americans will be seen as Pakistani terrorists as well by the ignorant. I am sure you are aware of the fact that Saudi/Qatar/Bahrain did not take any refugee from Syria. Did Trump told them so ? In any event, over 95% of Syrian refugees are in Muslim nations. Writing on a White House blog Tuesday morning, a 24-year-old writer for the Obama administration described how she and her family made it from Pakistan to the U.S. -- Westland to be exact -- and, in her case, on to the West Wing, forging their identities as new Americans. Asra Najam’s blog entry begins with the words “Mujhe Amreeka jana hai” -- “I want to go to America” -- spoken by her as a 4-year-old in Karachi to her father before her family began a journey that eventually landed them in southeastern Michigan, where her father worked as an engineer on a skilled worker visa. Najam’s blog entry comes at a time when, in the wake of attacks in Paris and California, many have called for a tightening of restrictions on programs to let people into the U.S. out of fear terrorists may try to infiltrate the country. The Obama administration has maintained its intention to settle some 10,000 Syrian refugees in the U.S. by next October. You can read Najam’s full blog post here: https://www.whitehouse.gov/blog/2015/12/14/being-american. It had been just five days since a visit to a Planned Parenthood clinic put Kentanya Craion in the middle of a massacre that left her cowering in a back room and her boyfriend among the three dead. This was the distinctly and distressingly American nightmare in which the people of Colorado Springs found themselves this month: grieving, confused and emotionally raw — but with all of those emotions amplified and distorted by a new mass shooting in a country where, by one measure, such attacks occur on average more than once a day. And the shooting in California, which claimed 14 lives, siphoned much of the national focus from Colorado Springs, replacing a high-intensity conversation about violence against abortion clinics with perhaps an even more intense one about violence committed by Islamic terrorists. “I knew it would be overtaken at some point,” Mayor John Suthers said. Unlike Mr. Suthers, a first-term mayor who has served as Colorado’s attorney general and as a United States attorney, Jane Delaney seems unsurprised that another mass shooting occurred so soon. Dr. Delaney, 65, a retired physician, was trapped inside the King Soopers grocery store for hours during the melee, in which a self-professed anti-abortion crusader, Robert L. Dear Jr., is accused of attacking the clinic and engaging the police in a tense five-and-a-half-hour standoff before his capture. Dr. Delaney said that the rampage at the clinic, which also left nine wounded, had itself eclipsed an episode here on Halloween morning when a man named Noah Harpham, 33, fatally shot three people before dying in a gun battle with the police. He left an angry blog post behind. “It seems like it’s happening every day,” she said. About five miles north, the Planned Parenthood building, still a crime scene, was empty, its parking lot surrounded by fencing and no-trespassing signs. A police officer kept watch, and a blue tarp covered the entrance. And yet life bustled all around, with patients heading in and out of appointments at a nearby medical building, and Salvation Army volunteers ringing bells for shoppers at the King Soopers, a few yards away, where Dr. Delaney and dozens of others had been trapped less than two weeks before. Quan Hoang, 25, who had also been trapped on the day of the shootings in his workplace, Fusion Nails, a salon near Planned Parenthood, tried to square the seeming normality the day after the shooting with the routine mayhem everyone sees on their Facebook feed and in the news daily. It was hard to do. “America’s becoming a crazy place,” he said. Here, as elsewhere, the attack in San Bernardino has changed the nature of the conversation about mass shootings, which now entails questions about homegrown radicalized Muslims and the influence of the Islamic State. Last Wednesday, a few hours before Mr. Dear’s court appearance, Mayor Suthers went to the studios of KVOR, an AM radio station, where he was the guest on a call-in show. He spoke about how both shootings showed how difficult it was to identify the perpetrators of mass murders before they occurred. He told people to call the police if they suspected their neighbors of acting strangely. In a paper published last month, Princeton economists Anne Case and Angus Deaton showed that over the last 15 years, white middle-aged Americans have been dying at unusually high rates. Most of those deaths were concentrated among people with only a high-school diploma, or less. Polls say that the same kind of people — older, less-educated whites — are largely responsible for Donald Trump's lead in the race for the Republican nomination for president. This could be a coincidence. But it is nonetheless striking that Trump’s promise to "Make America Great Again" has been most enthusiastically embraced by those who have seen their own life's prospects diminish the most — not in terms of material wealth, but in terms of literal chance of survival. Case and Deaton’s work has attracted some controversy. There's debate over whether the death rate has actually risen for white Americans aged 45-54, as they claim, or if it has just remained the same over the past two decades. But even their critics concede that the bigger picture is alarming. In countries such as Canada, the United Kingdom, France, and Germany, middle-aged people has been dying at ever-decreasing rates over the last 20 years. Middle-aged African-Americans and Hispanics in the U.S. have experienced similar trends: declines in the mortality rate of about 27 and 19 percent, respectively, since 1999. But something is wrong with white America — particularly, less-educated white America. Between 1999 and 2013, the death rate for middle-aged white people, age 45 to 54, increased by 9 percent, according to the paper. For middle-aged white people with a high school education or less, the death rate went up 22 percent. Now compare that to data from a new Washington Post-ABC poll, released Tuesday, which shows that Trump supporters are disproportionately white Americans without college diplomas. Among Republican-leaning registered voters, 46 percent of them support Trump, compared to 38 percent of Republican-leaning registered voters overall who support Trump. Case and Deaton blame dramatic spikes in poisonings (including drug overdoses), suicides, and liver disease as the main causes for the rising death rate among middle-aged white Americans. These problems have been most acute among the less-educated. Among those with no college, poisonings tripled between 1999 and 2013; suicides went up by 78 percent; death by liver disease increased by 46 percent. In other words, what's killing middle-aged whites is the opioid epidemic. It's depression. It's alcoholism. “At this time, when there is reason to be concerned for security around the world and here at home, we need to remain focused on keeping our communities safe and keeping our communities united instead of trying to build walls and scapegoat communities,” Trudeau said Wednesday. He said Muslims are “predominantly” the greatest victims of terrorist acts around the world. Trudeau’s strong words were delivered at a one-hour televised town hall at the National Arts Centre, where he took questions from journalists and citizens in the room, and from others through social media. The town hall, hosted by Maclean’s, featured Trudeau in shirt sleeves answering questions ranging from the serious, such as the combat mission in the Middle East and the plight of Canada’s indigenous people, to why his shoes don’t match his pants and what he thinks of the Star Wars movie. The prime minister was also asked if he would “stand up” to the rhetoric of Trump, who is the frontrunner in the race for the Republican nomination. In recent days, Trump has called for a ban on Muslims entering the United States, proposed a database to track Muslims there, and also repeated rumours that thousands of Muslims celebrated in New Jersey after the 9/11 attacks on New York’s World Trade Center. “I think it’s extremely important that someone in my position doesn’t engage in the electoral processes of another country,” Trudeau initially replied. “So I’m certainly going to be very cautious about engaging in this particular topic. Just because I think it’s going to be important for Canadians, for Canadian jobs, for Canadian prosperity, to be able to have a positive relationship with whoever Americans choose as their president. Without singling out Trump by name, Trudeau then launched into a long answer about the need for politicians to avoid divisive rhetoric. As of Sunday afternoon, The Washington Post called them "occupiers" — and more precisely, "an armed militia." The New York Times opted for "armed activists" and "militia men." And the Associated Press put the situation this way: "A family previously involved in a showdown with the federal government has occupied a building at a national wildlife refuge in Oregon and is asking militia members to join them." Not one seemed to lean toward terms such as "insurrection," "revolt," anti-government "insurgents" or, as some on social media were calling them, "terrorists." When a group of unknown size and unknown firepower has taken over any federal building with plans and possibly some equipment to aid a years-long occupation — and when its representatives tells reporters that they would prefer to avoid violence but are prepared to die — the kind of almost-uniform delicacy and the limits on the language to describe the people involved and the group is noteworthy itself. It is hard to imagine that none of the words mentioned above — particularly "insurrection" or "revolt" — would be avoided if, for instance, a group of armed black Americans took possession of a federal or state courthouse to protest the police. Black Americans outraged about the death of a 12-year-old boy at the hands of police or concerned about the absence of jail time or a conviction in the George Zimmerman case have been frequently and inaccurately lumped in with criminals and looters or depicted and described as marauding wolf packs where drugs are, according to CNN's Don Lemon, "obviously" in use. If a group of armed Muslims took possession of a federal building or even its lobby to, for instance, protest calls to surveil the entire group, they could avoid any of those harsher, more-alarming labels. In fairness to those assembled in Oregon, it is true that there have been no reports of actual violence, injury or anyone being held inside the Oregon building against their will. And in the interim, some may feel particularly inclined to take real care with the language used to describe the situation so as not to inflame it or offend people who, in some cases, have already been troubled by the decision to charge a father and son pair of ranchers with arson under the Antiterrorism and Effective Death Penalty Act of 1996. The charge not only carries what many of the rancher's supporters believe to be an unjust five-year jail term but; it brings the very same t-word into the mix. For those who know the father and son — Dwight Hammond Jr. and his son, Steven Hammond — personally, it is understandable that they would disagree vehemently with any government action that implies that the men they know as engaged members of the community are terrorists. But one really cannot help but wonder where similar outrage lives when, in the face of clear data indicating that black Americans are far more likely than white ones to face serious charges and jail time rather than misdemeanor penalties for resisting arrest. Where has the lock-step adherence to careful and delicate language been in all of 2015 when unarmed black Americans were disproportionately more likely to be killed by police than others? Beyond that seeming incongruity, the Hammonds are not among the occupiers. The man who has helped to organize the building occupation in Oregon is Ammon Bundy. Bundy is the son of Cliven Bundy, a Nevada rancher who engaged in a standoff in 2014 with the government over grazing rights. And the younger Bundy has, again, described the occupiers as "armed" and prepared to die. Barely a few sentences were passed between us when Ibrahim Hooper cut me off to tend to other business. “Hold on, I have another call,” he said. About twenty seconds later he was back with me, but he couldn’t quite remember who I was. The previous day, we had twice spoken by phone and exchanged emails. A formal interview was arranged, and I would be speaking with him at length. The story: What it’s like to work in in the communications office at the Council on American-Islamic Relations, the nation’s largest Muslim civil-rights organization. If anywhere, the office is the command center in the fight against Islamophobia in the U.S., I figured. Hooper, being the national communications director, would be the ideal person to talk with. But between the time I spoke to him the previous day and when I called him back, something monumental happened. It was revealed that Syed Farook and Tashfeen Malik, the married suspects responsible for the mass shooting of a public health facility in San Bernardino, Ca., which left 14 dead, were Muslim. “Muslim Killers,” read the front page of the New York Post. An anti-Muslim backlash was anticipated, and the group had been scrambling to control the message, setting up press conferences and communicating with countless media outlets. Again, just three minutes into our conversation, another call came in. It was CNN. “There’s a controversy brewing,” Hooper told me when he came back. News outlets had been let into the home of the shooters, and camera crews were fixing shots on all the personal items they could find. Family photos, underwear drawers, the baby’s crib. At one point, the lens of an MSNBC camera trained itself on the expired driver’s license of Rafia Sultana Farook, the mother of Farook, one of the shooters. It contained her address and other personal information. “They would never do this with the abortion clinic shooter, or the Newtown shooter, or any of the 355 mass shootings (Editor’s note: That number has since gone up) around the country. They would never do this,” said Hooper, leaning on me through the phone line for support. “But somehow it’s okay with Muslims,” he said. Hooper does not have an easy job. Every morning, he wakes up hours before going into the office, filtering through an extensive keyword news search, looking for recent anti-Muslim incidents around the country. Rarely is there a shortage. On the day we first spoke, his organization was figuring how to respond to a bullet-riddled Qu’ran that was found outside an Islamic store in Anaheim, Ca., about 48 miles from where the shooting in San Bernardino would happen hours later. Earlier in the week there was the story of a Muslim taxi driver who was shot in the back on Thanksgiving Day after the suspect allegedly probed him about his religion. A group of white supremacists were planning an anti-Islam rally in front of a Texas mosque. When he finally arrives in the office, he told me, the staff holds a briefing he likened to a news assignment meeting you would find in a television newsroom. “That will determine the direction of the day,” he said. “We’ll start working with the chapters, editing, suggesting communications content,” and coordinating with the legal team on language.